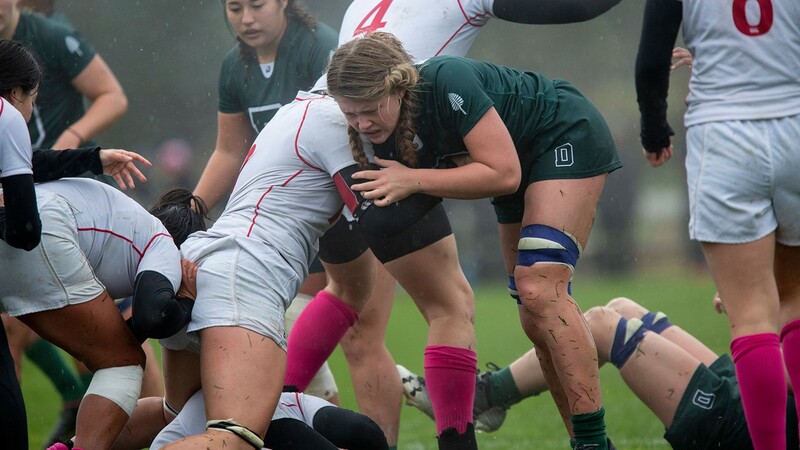 Nine different Dartmouth players had at least one try, while senior Camille Johnson, sophomore Marin Pennell and freshman Ale Ada all had two. Johnson led the way with 25 points from two tries, one penalty kick and six conversions for the Big D.
"Today was a great team effort from all 23 players on the roster," head coach Katie Dowty said. "The biggest key to the postseason for every team is depth, and we're very proud of how our veteran players have helped our newer players develop over the past few weeks. Today, we were able to spread out some invaluable match experience that will help us next weekend in the Final Four." Dartmouth started the game strongly when Ada scored the opening try just 49 seconds into the first half. After that, the Big Green took off, scoring six more tries in a 17-minute span (Margot Généreux, Sophie Ragg, Milla Anderson, Johnson, Ada and Pennell). Add three good conversions by Johnson, and Dartmouth had a 41-0 edge halfway through the first. It took less than nine minutes for Karina Martinez to get one of her own to further increase the Green's lead. The Bears tried their hand at a try, evading a few Dartmouth players before being taken down. A good penalty kick by Johnson gave the home team a 51-0 edge heading into the intermission. Dartmouth opened the second with three tries scored in eight minutes (Johnson, Pennell and Maya Perkins) to make it a 68-0 game. In the 15th minute, Brown broke through to score its first try of the match, but the Green responded two minutes later when Olivia Marquis scored her first collegiate try. The Bears appeared to find their stride after that, scoring two tries and adding a good conversion to get to double digit points (75-17), but the game ended soon after. On Friday, Nov. 16, Dartmouth will host both semifinal matches at Brophy Field. The Big Green will play the Army at 12 p.m., while the Harvard will take on the winner of the Notre Dame College/Quinnipiac matchup at 2 p.m. The championship game will be played on Sunday Nov. 18. WEST POINT, N.Y. - The Army women's rugby team is moving on to the final four of the NIRA Championships, after a masterful 61-3 victory over Norwich at the Anderson Rugby Complex. HAMDEN, Conn. – The No. 3 seed Quinnipiac women's rugby team dominated from start to finish Saturday afternoon as the Bobcats cruised to a 46-5 over the No. 6 seed Notre Dame College Falcons in the NIRA Quarterfinals.